The rise of Babylon and the rebuilding of Zion in London. As u see there was a lot of witches and free Mason sacrificing children so the egg can be fertilize and hath. In the Brazil Olympic based on my observation there is a lot of water and wave symbology. We are now fully in the Aquarius age the flood cause by so called global warming which should be called climatic chaos at best the earth is more than warming up by just man but also the sun and man trying to control the weather and some say that there is a bit of cooling to? The opening ceremony of the 2016 Summer Olympics took place on the evening of Friday 5 August 2016 in the Maracanã Stadium, Rio de Janeiro, starting at 20:00 BRT (23:00 UTC). As mandated by the Olympic Charter, the proceedings combined the formal ceremonial opening of this international sporting event (including welcoming speeches, hoisting of the flags and the parade of athletes, as well as a new feature—the presentation of the International Olympic Committee‘s Olympic Laureldistinction) with an artistic spectacle to showcase the host nation’s culture and history. Directed by Fernando Meirelles, Daniela Thomas and Andrucha Waddington, the ceremony featured presentations of the history and culture of Brazil, including its landscape and forests, the history of the Portuguese people, music and samba, and the favelas among other aspects. Portions of the ceremony were also dedicated to the topics ofenvironmental conservation and climate change. The Games were officially opened by Acting President of Brazil Michel Temer. Despite having a significantly lower budget than those of other recent Olympics, the opening ceremony of the 2016 Summer Olympics was praised by the international media for its vivid, diverse performances, emphasis on multiculturalism, and its appeal to the issue of climate change. The creative directors for the ceremony were Fernando Meirelles, Daniela Thomasand Andrucha Waddington. Brazilian choreographer Deborah Colker prepared a cast of over 6000 volunteers who danced in the opening ceremony. Rehearsals started at the end of May 2016. Meirelles stated that the ceremonies for the 2016 Summer Olympics would have a significantly lower budget than those of other recent Olympics, totalling only 10% of the total budget for the ceremonies of the 2012 Summer Olympics. Explaining his rationale, he explained that he would be “ashamed to waste what London spent in a country where we need sanitation; where education needs money. So I’m very glad we’re not spending money like crazy. I’m happy to work with this low budget because it makes sense for Brazil.” Meirelles outlined that because of the lower budget, the ceremony would eschew “high-tech” ideas such as moving stages anddrones; fellow ceremonies director Leonardo Caetano went on to say that the concept of the ceremony would emphasize “originality” over “luxury”, and “compensate with creativity, rhythm and emotion”. On 15 July 2016, it was announced that Anitta, Caetano Veloso and Gilberto Gil would perform during the opening ceremony. Gil and Veloso had also participated as creative advisors for the ceremony. Creative director Daniela Thomas explained that their involvement was meant to reflect the best in Brazilian music. For the 2014 FIFA World Cup and the 2016 Olympics and Paralympics, a major reconstruction project was initiated for the Maracanã Stadium. The original seating bowl, with a two-tier configuration, was demolished, giving way to a new one-tier seating bowl. The original stadium’s roof in concrete was removed and replaced with a fiberglass tensioned membrane coated with polytetrafluoroethylene. The new roof covers 95% of the seats inside the stadium, unlike the former design, where protection was only afforded to some seats in the upper ring and those above the gate access of each sector. Fernando Meirelles said in September 2015 that the ceremony would be a vision of the country “and what I hope it will become”. Meirelles said he would try to steer away from clichés, but not all of them; for example, the carnival has been confirmed to be a part of the ceremony. The opening ceremony began with aerial images of the city of Rio de Janeiro in a music video with the song “Aquele Abraço“, sung by Luiz Melodia. There was a brief instrumental version of Marcos Valle‘s Samba de Verão or Summer Samba during the portion with performers in silver suits with giant silver sheets. After the projection of the first images, the International Olympic Committee president Thomas Bach was introduced. Singer Paulinho da Viola sang the Brazilian National Anthemon a stage inspired by the architectural forms of Oscar Niemeyer. The singer was accompanied by a string orchestra. Brazil’s flag was raised and 60 flags were carried by Olympic Brazilian athletes Virna Dias, Robson da Silva, Maurren Maggiand Flávio Canto and children. The artistic performances were set into motion with an homage paid to the spirit of gambiarra, defined by the organisers as “the Brazilian talent for making the most out of nothing”. In this part of the opening ceremony, Brazilian design was honoured with references to Athos Bulcão, indigenous geometry, African prints and Portuguese tiles. Peace and sustainability were featured with the transformation of the peace symbol projection into a tree. This part of the opening is also an homage to the Amazon rainforest,wich biggest part,covers the country. This was followed by the representation of the birth of the immense forests that covered Brazil and the arrival of the Portuguese people. From the beginning of life, the ceremony illustrated the formation of the indigenous peoples, whose entrance was represented by 72 dancers of the two major associations of the Parintins Festival. The arrival of Europeans in caravels, the forced arrival ofenslaved Africans and the immigration of Arab and Japanese people was represented by descendants of these ethnic groups. One parkour group crossed the stage and jumped on projections of building roofs in the ceremony that highlighted the urbanisation of contemporary Brazil, concentrated in large cities. To the sound of the classic song “Construção“, by Chico Buarque, acrobats scaled the façades of buildings and set up a wall, behind which a reproduction of the 14 Bis plane, flown in real life 110 years earlier in the suburbs of Paris arrived with an actor playing the Brazilian inventor Santos Dumont.Gisele Bündchen interpreted the “The Girl from Ipanema” and walked through Maracanã Stadium, while Daniel Jobim, grandson of composer Antônio Carlos Jobim, played the classic song. The walk of Gisele followed the curves that characterised Niemeyer’s works, such as the Pampulha Church and the Cathedral of Brasília. It was later revealed that a pre-planned segment was in place for Bündchen after her catwalk, but it had to be cut because she walked too slow during the catwalk. After Ipanema, the favelas were represented to the sound of samba and funk carioca, with singers Elza Soares, who played the “Canto de Ossanha”, andLudmilla, who singed the “Rap da Felicidade”. RapperMarcelo D2 and singer Zeca Pagodinho simulated a duel of rhythms. Rappers Karol Conká and MC Sofiafollowed. Cultural performances that simulated conflicts as maracatu and the bumba-meu-boi shared the stage of the stadium. Actress Regina Caséappeared in the stage and mediated the conflict, before she and the singer Jorge Ben Jor singed the hit song “País Tropical”. After that, the delegations representing 207 nations then marched into the stadium during the Parade of Nations. The crowd gave large applause for other Latin American nations as well as notably Spain, the USA, Canada, Portugal, and Russia. However, the biggest applause (aside from the host nation) came when the team of Refugee Athletes marched into the stadium just ahead of the Brazilian team. They received a standing ovation from the crowd. The Brazilian team was led into the stadium by model Lea T, the first transgender person to participate in an Olympic opening ceremony. After the parade of nations, there was a massed parade of the 12 samba schools of the Rio Carnival‘s Special Group, and singers Anitta, Caetano Veloso and Gilberto Gil performed the song “Sandália de Prata”, by Ary Barroso. The segment was a tribute to Rio’s most famous signature event; the Rio Carnival, which happens on the last four days before Ash Wednesday. Caetano Veloso, Anitta and Gilberto Gil. A short video on anthropogenic climate change – one of the themes of the event – was also brought to fore during the ceremony. The video, narrated by Brazilian Academy Award-nominee actress Fernanda Montenegro and British Academy Award-winning actress Judi Dench, also reading from Carlos Drummond de Andrade‘s poem “The Flower and the Nausea”, featured Ed Hawkins’ visual spiral indicating rising global temperatures, together with an animated projection of rising sea levels on places that included Amsterdam (host of the 1928 Games); Dubai;Lagos; Shanghai; Florida; and the city of Rio de Janeiro itself. Kenyan athlete and two-time Olympic champion Kipchoge Keino ran up to the stage to receive the first Olympic Laurel award, accompanied by children flying 200 white kites shaped like doves. Earlier, children in Kenya inscribed messages of peace on the kites. After the speeches by Rio 2016 Organizing Committee President Carlos Arthur Nuzman and by IOC President Thomas Bach , Brazil’s Acting President Michel Temer recited the games’ opening declaration from the stands. Contrary to usual practice, he was not introduced at the beginning of the ceremony, nor was he introduced at the end of President Bach’s speech. After a burst of fireworks, the Olympic Flag then entered the stadium, and was raised while the Olympic Anthem was sung. The Olympic oath on behalf of the athletes was then recited by Brazilian sailor Robert Scheidt. The corresponding oaths on behalf of the judges and coaches were taken by Martinho Nobre and Adriana Santos respectively. Furher artistic performances followed. Ending the Olympic torch relay at the end of the Opening Ceremony, Gustavo Kuerten brought the Olympic torch into the stadium, relayed the Olympic flame to Hortência Marcari, who relayed to Vanderlei Cordeiro de Lima, who then lit theOlympic cauldron. Vanderlei de Lima lighting the Olympic cauldron. 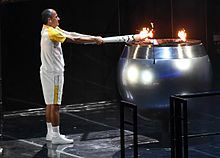 The cauldron was lit by Vanderlei Cordeiro de Lima, marathon bronze medallist at the 2004 Summer Olympics and recipient of Pierre de Coubertin medal. It had been speculated that Brazilian footballer Pelé would light the cauldron, but he was unable to attend the ceremony because of health problems. As part of the organizers’ focus on reducing the effects of global warming, the Olympic cauldron took on a simpler form; it was designed to produce a smaller volume of flame and fewer emissions than previous cauldrons. To enhance the lighting of the smaller flame, it was accompanied by a kinetic sculpture by Anthony Howe, featuring spinning bars of reflective spheres and plates that are designed to evoke the “pulsing energy and reflection of light” of the sun. The sculpture is 12.2 metres (40 ft) in diameter, and has a weight of 1,815 kilograms (4,001 lb). A version of the cauldron was placed on public display in a plaza in front of the Candelária Church. The public cauldron was lit by Jorge Gomes, a 14-year-old runner that had participated in Rio’s Vila Olimpica program—which provides access to sports training facilities to disadvantaged youth. Projeto More – Olympic Hymn. Early estimates indicated that at least 100 heads of state or government were planning to attend the opening ceremony. However, some foreign leaders have been slow to commit to their attendance because of the ongoing political issues and other issues affecting the Games. 29 heads of state have confirmed that they are attending the ceremony. Christine Brennan wrote for USA Today: “The Rio opening ceremony was exquisitely choreographed as a boisterous show, a poignant social statement and a bold challenge to the world. Who needs money when you have a conscience?”. Tom McGowan of cnn.com described the ceremony as “vibrant” and highlighted how it “saluted the country’s past and pointed towards a greener future”, as well as noting that the ceremony was carried out smoothly despite Meirelles describing the final rehearsal as a “disaster”. Meredith Blake, a reporter from the Los Angeles Times, also praised the organizers who delivered an inspired, vibrant spectacle despite having a lower budget than in previous editions. However, she criticized the American television networkNBC for not making a live broadcast of the ceremony. As a result, some areas of the United States only got broadcasts of the event with one- to four-hour delays due to the primetime air time during which NBC wished to broadcast the Olympics, as well as the differing time zones in the United States. David Rooney from The Hollywood Reporter wrote: “Director Fernando Mereilles and his team delivered a sobering call to address global warming and deforestation cloaked in a stirring multicultural celebration of tolerance”. He continued: “Mereilles promised a show assembled for just a fraction of London’s $42 million price tag. That meant an emphasis on low-tech performance, physical theater and emissions-conscious pyrotechnics. The result was a refreshingly analog opening defined by its rich humanity, exuberant warmth and its spirit of indefatigable resilience”. The Guardian’s Misha Glenny wrote that Mereilles “pulled off something quite remarkable with this spectacular show, on a budget that seemed to shrink every day”, which “combined his dazzling cinematic skills with some extraordinary choreography and lighting displays, and a strong narrative thread that explained Brazil’s complex history to the outside world”.